TLDW: Check and evaluate. They are passive, their bets are more meaningful. They might bet small enough to give you odds to chase for a boat or quads. Not sure I agree that you are *not ahead of there calling range. As I range these opponents they have more than twice as many top pair, Two pair, lower sets, Pair+draw hands as they do made flushes on this turn. I ranged them to have called with all broadway cards, all suited aces, all pairs, and all suited connectors pre flop (about 20% of hands. If that is the case then when the 2c hits the turn they have a flush only less than 7% of the time. But, they have top pair, two pair, smaller set, Pair plus draw over 17% of the time. There are a lot of hands that continue on this turn that are not flushes. In fact, a lot more than are flushes. Just to be sure, the is on the flop, and NOT in our hand, right? For those of you jamming, is this because of stack size? How do you play your sets on flushing turns with deep stacks? Stack sizes make jamming here easier, yes. But I'd be betting this turn with deep stacks as well a large chunk of the time. There is a balance here that I did not mention in the video. We can often catch people making strange value bets in situations like this. For whatever reason, bad players often try to protect their hand after the scare card comes in. Essentially by checking we can pick up some weird value-own scenerios. The jam has merit for sure because it does not give a free card to those that can outdraw us with a single club or a straight draw. We have equity against all the made hands anyways. I am much more willing to let free cards roll off and often get paid in weird spots from people value-owning with hands they should be checking back. When they have true value hands, they are often betting very smaller than they should against me. Doug, yes, I often perform this check, as it at least seemingly has the benefit of not overrepping my hand as a flush so I can get one more bet on the river, but it seems that mostly the flush draw simply kills the action and the one pair hands fold the river. Trying to find a balance between continuing on the turn and not, essentially. Have to agree with Split here Doug. We can't expect to get any value when our opponents are both passive. Neither is likely to make the weird protection bets and will take the free card. Shoving at least has the chance to get a call from a big draw. I think checking is good with deeper stacks,and opponents who will bet more often. I'm betting through Turn but I'm sure no one is surprised with that lol. I agree with Split. We are still at the top of our range and our opponent has enough worse that we want to value bet and protect our hand. Have to agree with Split here Doug. I find it hard to disagree with James and Christian, for sure! It is not an exact science. I think these hands that have a variety of well reasoned answers bring up the best discussion. Debating the merits of each action gives insight into other situations that are more clearly defined based on the questions asked. For instance, when discussing off-line someone suggested the problem was on the flop. If we overbet the pot we end up with an easier stack size decision on the turn when one of the multiple scare cards inevitably comes. If we have a 0.5 x Pot bet on the turn, this is easy. If we have 1.5 x Pot like we do now it is much worse as we see. I think I am being swayed towards the jam the turn. 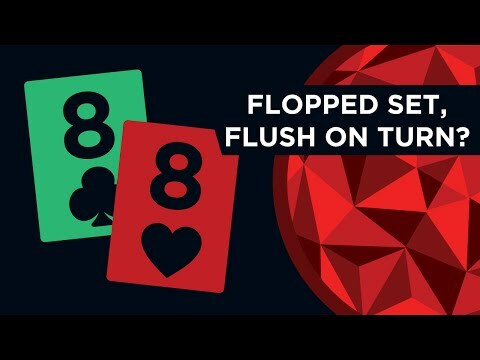 Though the overbet on the flop makes sense, I think it does so only in hindsight. 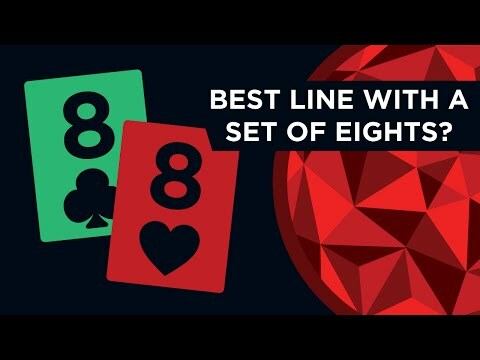 If we overbet the pot on the flop, we're less likely to get callers. In this example if we bet $55 into $35 on the flop and get only one caller, the pot is $145 instead of $105. It does make the pot bigger, but not enough to get away from the awkward SPR on the turn ($190ish behind with $145 pot). Thank you for joining us. It is unclear what you are trying to communicate above. Can you clarify? As played I bet Turn. I really like the idea of check raising this flop Christian, but I'd be worried with the description of these villains that the flop would check through with all their draws. But if I expected someone to almost always bet I think c/raise is perfect here. I'd like to continue the hypothetical where we take this line on the flop but the flop is checked through - effectively we're practically in the same spot as the flop except the board is worse for us now is this ch/eval/possibly jam? Passive players should give us some general info about their hand strength within their bet size. We can nullify our OOP information disadvantage as well. However I feel like donk leading here w/ an image that is FOS isnt terrible either. I hate to bet/fold but i doubt either of them raise this turn w/ single club hands (and probably dont raise w/ 100% of flushes), so im not exactly loving donking for that reason either as i expect a showdown if our turn bet is called. Im curious about this hypothetical decision tree when we whiff our c/r as far its EV in comparison to simply being the aggressor 2 streets and jamming turn. We lose value when it's checks through. We would bet Turn and River for pure value even on this specific Turn. And we would bet on most rivers. In exchange for possibly losing value when it checks through however- we help protect other portions of our range nicely. So I wouldn't look at the play in a vacuum and more look at your overall strategy on this board as the original raiser.